Lions and tigers and bears … in a hospital? Oh my! But, for Our Lady of the Lake Children’s Hospital in Baton Rouge, that’s exactly what doctors are prescribing for their young patients. The elixir is the San Diego Zoo Kids, a closed-circuit television adventure channel now available in the children’s hospital rooms. It’s something that is helping to create a healing environment, according to Dr. Trey Dunbar, president of OLOL Children’s Hospital. 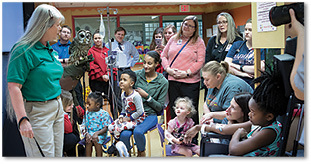 Dunbar noted some children might not be able to make the distance to the hospital’s playroom to see visiting pets, or the animals might not be allowed in the rooms for sanitary reasons. “So having a channel where you have this exposure to the animals and the education that goes with the San Diego Zoo Global channel is huge for us, the kids and the families – just to be able to help create that healing environment, and give them exposures that they may not otherwise have,” said Dunbar. Funded through a donation from philanthropist T. Denny Sanford, San Diego Zoo Kids provides family-friendly, animal-oriented programming that is entertaining and educational. The channel also features animal stories from BREC’s Baton Rouge Zoo, along with more than a dozen accredited zoos and aquariums throughout North America. Dunbar said the zoo channel fits in “very well with the type of environment that we’re trying to provide.” The new Children’s Hospital has an animal motif and each floor is designated to an animal that’s indigenous to Louisiana, according to Dunbar. Jennifer Shields, education curator for the Baton Rouge Zoo, is thrilled with the new partnership and brought along some furry friends to be introduced to patients during the announcement of the zoo channel on Feb. 1. The kids got an up-close encounter with Shakespeare, a barred owl; Tawanda, a tenrec; and Xenon, a ferret. Some segments have already been filmed in the Capital City and have been incorporated into a series of segments, according to Shields. Shields’ takes the wild ones on the road with the zoo’s mobile program, visiting schools, Alzheimer’s groups, retirement communities and libraries. She is excited to add this new dimension to the zoo’s outreach initiative. Shields is already familiar with the projects at the San Diego Zoo and even their personnel. She worked there before coming to the Baton Rouge zoo almost 10 years ago. She said the new collaboration has given her quite a few ideas on how the critters can help forge connections in other areas. But for now, the animals will be linked via satellite to the medical world and hopefully create a different world, one of healing. Dunbar said seeing the kids interact physically with the animals was very moving. 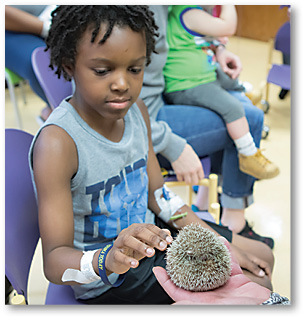 A patient from OLOL Children’s Hospital reaches out to pet Tawanda, a tenrec. The tenrec, along with an owl and a ferret named Xenon, belong to BREC’s Baton Rouge Zoo. They were brought to the hospital for a visit with the kids during the announcement of a new channel, San Diego Zoo Kids.